The Medallions' The Letter is one I'm also tempted to put in the pantheon. More than most others mentioned it's hard to be certain of any particular vocal skill (haven't heard other Medallions tracks, including Buick 59). It seems – not even a demo, but the faintest sketch of an idea: an echo of an echo. Yet it works; it's one of the good ones. Knowing well that I should? I just love the way the song sort of trickles to a halt, as though, having just spent himself with the effort of this confessional, Vernon and his alter ego/echo simply stop ... Or is it that the suddenness of the epiphany - he loves her but she "just won't be true" floors him/them at the end? I also like, and it's part of why this ridiculous record has a place in my heart, the way that Vernon has, despite the care in creating this fancy composition, travelled lunar distances beyond words as we understand them. There's a particular neologism (if that's the right word) I'll return to, but what exactly is the "purportance" of Love whereof our hero speaks? Is Vernon thinking of purport, which my dictionary has down as a claim, "esp. false", to be something? That doesn't feel right: this record may be naive, but it's not cynical. Which is why Steve Miller's hijacking of the phrase and roping it in with other more swaggering steals from other songs seemed plain wrong: Vemon ain't no Gangster of Love, nor was meant to be; he is, I'd say, a fifteen year old alone in his bedroom, struggling to take upon himself the mystery of things - hey, as you do, after a spot of girlfriend trouble. Which leaves us only with that other coining. If "Writing about music is like dancing about architecture," as (I think) that doowop fan Frank Zappa said, then I'm especially aware of the presumption in trying to net - in both senses - this elusive specimen. But my joshing tone comes out of deep affection and I'm fully aware that Green's is the mastery (and mystery), not mine. Besides, didn't he invent "pismotality"? So maybe, like Alice, I'm only a thing in his dream – or, to stand back further, a drop in that vast ocean of golden teardrops which is The Whole Damn Thing: singers, listeners, lovers, scribes, memories, impulses and - at the heart of it all - a girl, real or imaginary, who still represents, as she always did, a future dazzling with possibilities, sweet dreams of contentment. Meanwhile, I'll keep hoping, as doubtless we all are, to catch the echo of those all-solving, all-healing sweet words of pismotality from that ideal doowop record which nestles somewhere in the track listing on the next CD compilation I buy. 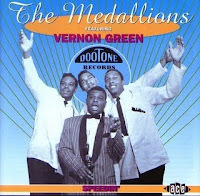 A full history and discography of the Medallions and other Vernon Green groups can be found in Marv Goldberg's R&B notebooks series here. 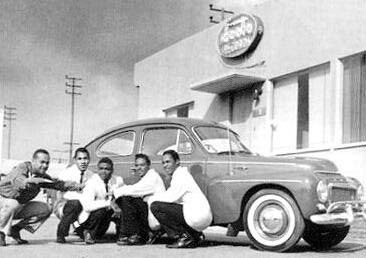 I have now heard the wonderfully uncoordinated Buick 59, part of an Ace Records compilation called Speedin' which seems the most comprehensive Vernon Green and the Medallions collection you can get; I'm both ashamed and proud to say I effectively bullied a group of students into buying me a copy when I left my former job. There's a lot of good doo wop material on it, although nothing quite matches the wonder of The Letter, including a retread/sequel entitled The Telegram. One of the original readers of that post on the Kewl website very kindly sent me a video of Vernon Green performing that song in later life; it was heartwarming to hear the whoop of recognition and appreciation which went up at the mention of "pismotality" and what I would now call the "puppeteuse" of love, especially (as the full set of posts will make clear) for me, growing up in Scotland in the seventies, doo wop was a private pleasure: I had no idea that others had heard, let alone been been moved by, that ridiculous yet affecting song. Talking of "puppeteuse," "pompatous, " "pulpitudes," "purportance," etc, there are many explanations on the net. This article by Cecil Adams on the Straight Dope website, prompted by the release of the 1996 move The Pompatous of Love, is the fullest and most amusing account I can find, especially as the writer's assistant, J.K. Fabian, actually had the chance to speak to Green. There are even more variants of the famed words in the article, but J.K. notes that "Green wasn't much for writing things down, so the spellings are approximate." The reason I personally favour "puppeteuse" is that I discovered that spelling of it in a separate article on the gangster-of-love website a few years ago. The site seems to have gone but that particular piece is still floating around, often reproduced or quoted when the meaning of The Letter is being debated yet again (and yes, it really does happen quite a lot). The material in it seems to derive from the article I've linked to, however, as part of Green's interview is quoted verbatim, so maybe the creator of the gangster-of-love site accepted the rest of the information but just decided to go with his own ears. It's more felicitous, somehow, maybe because it echoes the word "purpose"; "puppetutes" in the Adams article seems more formal, with a possible echo of "statutes" - and surely love is not about being rulebound but purposeful? Vernon Green, the author of The Letter, says, "You have to remember, I was a very lonely guy at the time. 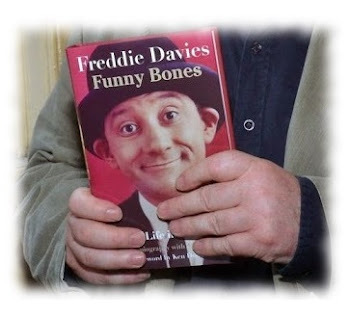 I was only fourteen years old, I had just run away from home, and I walked with crutches." The uneducated but imaginative youth was prone to fantasy, so he just made up the lyrics. 'Pismotality' described words of such secrecy that they could only be spoken to the one you loved. "And it's not pompitous," he emphasizes. "What I said was 'puppetuse', which is a term I coined to mean a secret paper doll fantasy figure." So this could explain the tone of The Letter: less exhibitionism, perhaps, than a kind of daffy, unanchored desire which is touching as well as being slightly ridiculous; it would certainly fit with the idea of someone given to practising his recitations on the speaking clock. Marcus then proceeds - or affects? - to hear "pismotality" as "dismortality," and it's hard to tell whether Liberman is running after him to offer support for this theory or making rude gestures behind his back. Either way, Liberman's playful article offers no definitive answers (how could it?) but concludes, by way of promise or threat: "Frank Zappa may be dead and gone, but the linguists are still on the case." My tip? Adams and Unca Marvy (who associates pompatus with "pulchritudes") are all you really need but please, please mentally substitute the word "puppeteuse" at the relevant moments in both pieces for the full effect. Thank you. Sadly, Adams ends with the information that Vernon Green died on Christmas Eve 2000.